PIANIST Sally Greenaway is one of the most original talents on the Canberra scene and now with voting closing at midnight on Sunday (May 21), time for Canberra music lovers to get her into ABC Classic FM’s “Classic 100”. Greenaway’s entry is vocal piece called “Stay Awhile”, written for a friend who was going through a terrible time and described by one admirer as “hauntingly beautiful”. The University of Canberra Chorale sang it for its mid-year concert a couple of years ago and again at Christmas for the vice-chancellor’s party. It’s also been described as “a true expression of love”, very appropriate since the slogan for the classic 100 is “Love – Music of Passion and Heartbreak”. Greenaway is a musician, composer, and piano performer in all genres, and has written classical chamber works, jazz big band works and more than 20 film and documentary soundtracks. 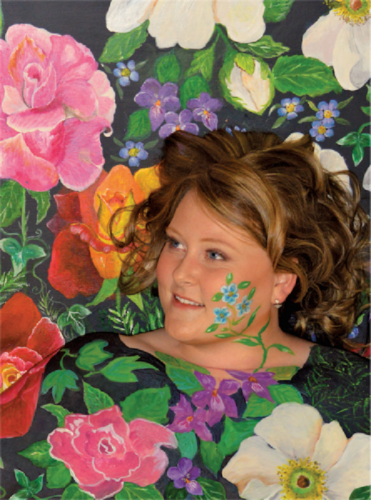 She’s also a good sport, allowing artist Anne Hind to paint her body with flowers for a promotional photograph. While in London she played jazz piano at the London Chopin Festival on Steinway’s “Ferrari” grand piano, and for a private party on Liberace’s rhinestone grand piano at the Dorchester, which can be viewed/heard as performed by Canberra’s Luminescence Chamber Singers, on YouTube.